My neighbor received the following recipe from her son and she wasn’t happy with the results. So she gave me a copy of the recipe and VOILA. Delicious bread with no kneading. This recipe is not only fool-proof, in my opinion, but only requires four basic ingredients you all have on hand. 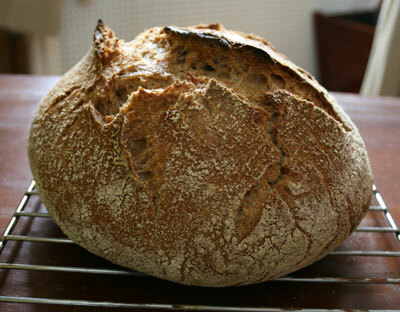 You really must try it, as it will transform your bread baking experience while delighting your family. 3 Cups all purpose flour or bread flour (More on a Whole Grain version later). 1. In a large mixing bowl, combine flour, yeast and salt. Add the water and stir until blended; dough will be shaggy and sticky. Cover the bowl with plastic wrap and allow the dough to rest for 12-14 hours at room temperature, about 70 degrees. 2. Dough is ready when the surface is dotted with bubbles. Lightly flour a work surface and place the dough on the floured surface. Sprinkle with a little more flour. Using just enough flour to keep the dough from sticking to your surface or to your fingers, gently and quickly shape the dough into a ball in about 30-60 seconds. Pinch seam together on the bottom. The less handling the better. 3. Generously coat a cotton kitchen towel (not terry) with flour, wheat bran or corn meal. Place the dough seam side down on the towel and dust with more flour. Cover with another cotton towel and allow to rise for 2 more hours or so. The dough is ready when it is more than double in size. This dough isn’t likely to fall. 4. Pre-heat your oven to 450 degrees with a 6-8 quart heavy covered pot such as cast iron, enamel or Pyrex, in the oven to pre-heat as well. After about 25-30 minutes, carefully remove the pot from the oven. Slide your hand under the towel, and flip the dough over so the seam side is up. You may think you have wrecked your loaf, and it may look messy, but trust me on this, this is OK. With seam side up, the loaf “blooms” or opens up while baking. Cover the pot with the lid. Return to the oven for 30 minutes. Remove the lid and bake another 15 minutes or until the loaf is beautifully browned. Cool it on a rack. I know this isn’t the healthiest loaf, so I have perfected a whole grain version, but enjoy this coarsely textured, full-body flavored loaf. I will post the whole grain version next time. Tell me what your experience with Artisan Bread was like!